Touch Sensors, Voice Recognition, and Other Sensors Enable Augmented Reality, Virtual Reality, and Artificial Intelligence - Touch Display Research, Inc.
Santa Clara, California, October 25, 2016—Touch Display Research announces the publication of “Sensors for Augmented Reality, Virtual Reality and Artificial Intelligence market 2016 Report.” This report is a comprehensive analysis of voice recognition, gesture control sensor, motion sensors, and over 20 sensor technologies for augmented reality (AR), virtual reality (VR), and artificial intelligence (AI) market. 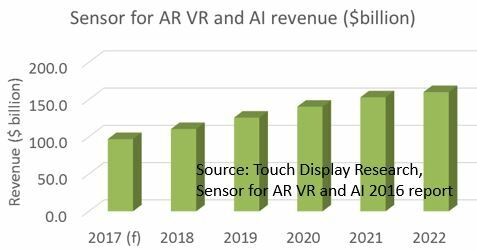 Touch Display Research forecasts that sensors for AR, VR, and AI market will be $97 billion in 2017, and will reach $160 billion in 2022. “Facebook/Oculus, HTC Vive, and Microsoft have their augmented reality (AR), virtual reality (VR) and mixed reality devices in the market already. Google’s virtual reality (VR) device Daydream View, and Sony’s PlayStation VR just entered the market this month. 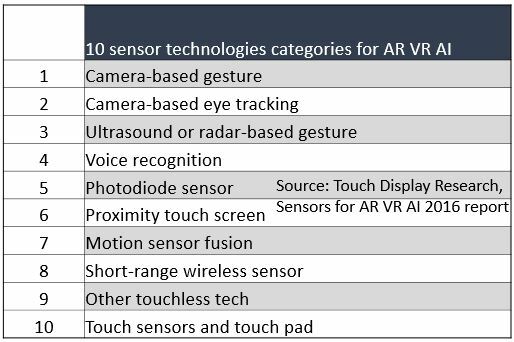 Although Apple hasn’t announce any AR/VR product yet, Touch Display Research forecasts that Apple will release augmented reality (AR) devices in the 2017/2018 time frame. The most important components in AR, VR, and AI are touch sensor, voice recognition, gesture control sensors, and motion sensors,” said Dr. Jennifer Colegrove, CEO and principal analyst of Touch Display Research Inc. This report is a comprehensive analysis of the over 20 sensor technologies for augmented reality (AR), virtual reality (VR), and artificial intelligence (AI) market. We arranged the over 20 sensor technologies into 10 categories: touch sensor and touch pad, camera-based gesture control, ultrasound and radar based gesture control, eye tracking, voice recognition, photodiode sensors, proximity touch screen, motion sensor, short-range wireless and other touchless technologies. Key players are analyzed one-by-one in Chapter 16. Colegrove, author of this report, was the first analyst to write a comprehensive touch screen industry report in 2006, and has authored touch reports for the past 10 years. In the area of gesture and voice control she has been writing reports for over 4 years. She performed first hand surveys and interviews with many sensor suppliers and OEM/ODMs. This report provides a regional analysis for the U.S., Germany, Japan, Canada, Taiwan and other countries. Market data in the report includes 2015 historical data and forecasts from 2016 to 2022. The market forecast includes sensor unit, ASP ($) and Revenue, with detailed breakdown by 3 markets: augmented reality (AR), virtual reality (VR), and artificial intelligence (AI). • Touch Display Research experts have been writing comprehensive reports on sensors market for over 9 years. You can purchase and receive the report today. “As Past President and Fellow of SID I can say that your presentation on Touch Display was very comprehensive and covered more than touch but all of the ways to communicate with a terminal. We all enjoyed and gained from your presentation.” — Past SID President and Fellow of SID.